You love clothes. You love the way people wear their personalities so differently and express themselves without having to say a word. 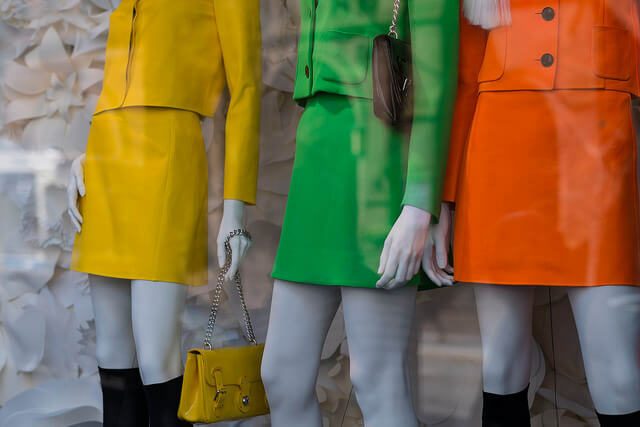 But it’s not just the way people wear their clothes, it’s how those same clothes get from the runway to the store windows that decorate city streets. And then—most importantly—into your shopping bag. What draws us to them? Who designs that window display customers drool over every day? How do designers interact with customers? So you go to school, and you think you’ve found just the major for you. It’s a lot more than just online shopping. According to Fashion Institute of Technology SUNY class of 2015 graduate Lucy Hinchliffe, fashion merchandising majors can expect a lot of “highly specialized courses in business practices including: financial planning, inventory management, marketing, promotional methods and product development.” Business classes ground majors in real world, industry-based situations. A well-rounded understanding of the industry will start with “levels of the product life cycle,” and go as in-depth as to “interpret customer behavior and finally how to apply this understanding to the planning, buying and promotion of merchandise,” said Hinchliffe. So yeah, definitely more than just shopping. 3. “While the professors I had were very knowledgeable about the industry, as they had almost all worked in the industry, many of them didn’t necessarily have teaching backgrounds.”–Hannah Reinhardt, Fashion Institute of Technology New York Class of 2015, Digital Publishing Start-Up. Hinchliffe said the job of a buyer for a department store is to “trend forecast, select merchandise and ensure that all product is received and hits the floor and the web successfully.” It’s like being a meteorologist, but for something much more fun. Reinhardt said this is the “less glamorous part of the industry,” but sees its worth. “It’s one of the best paying fields and there are a lot of opportunities for it right now,” she said. This path leads to more of a planning career. According to fashion.merchandising.com’s career blog, allocators distribute merchandise to stores based on current inventories, the store’s sales’ history and other determiners. This requires skills such as forecasting, organization and technical skills to keep store shelves up to date with current fashions and styles. The account executive position is a bridge between manufacturers and buyers, and wears a few hats on the job (no pun intended). They manage multiple retail accounts, impress buyers with their company’s collections and keep everyone on trend with updated fashion information and tips for store employees, according to the career experts at FIDM. You’re the money guy with the charm to match. One day you too could be Meryl Streep in The Devil Wears Prada and rub elbows with Stanley Tucci. Classified as an advanced career in fashion merchandising, your degree can get you a job as a fashion director (aka fashion coordinator). This job is both creative and organized. Because of their experience, education and influence, fashion directors can have quite an impact on the fashion world, and emphasize the need for organization and communication skills. Remember us little people when you’re revolutionizing what we wear next spring. According to LIM college’s career site, a degree in fashion merchandising can land you an exciting career as a product developer. This job requires a unique understanding of customers, especially those that stores are most hoping to attract. LIM experts say that to familiarize themselves with the demographic stores are looking to sell to, product developers research how stores are doing. It’s then the job of the developer to figure out how to take this season’s new trend and make it something that will pop on a hanger at Forever21. This requires some innovative thinking, and some store performance research. All of which you now have in spades.